Pope Francis offers a small silver crucifix to people present for the Angelus, distributed by poor, refugees and volunteers. "But who do you say I am? Jesus today asks this question ... of each of us ". The mission of Jesus "is accomplished not in the wide road of success, but in the arduous path of the suffering Servant". "We find happiness only when love, the real love, meets us, surprises us, changes us". Applause for Don Pino Puglisi and Sicilians. Vatican City (AsiaNews) - "The Cross of Christ contains all the love of God; there we find his immeasurable mercy": these were the words of Pope Francis repeated in Italian, English and Spanish that accompanies the small crucifix in silver metal (photo 2) that today the pontiff wanted to give to everyone present in St. Peter's Square for the recital of the Angelus. The poor, the homeless and the refugees distributed them, along with many volunteers and religious working with the Apostolic Almonry. 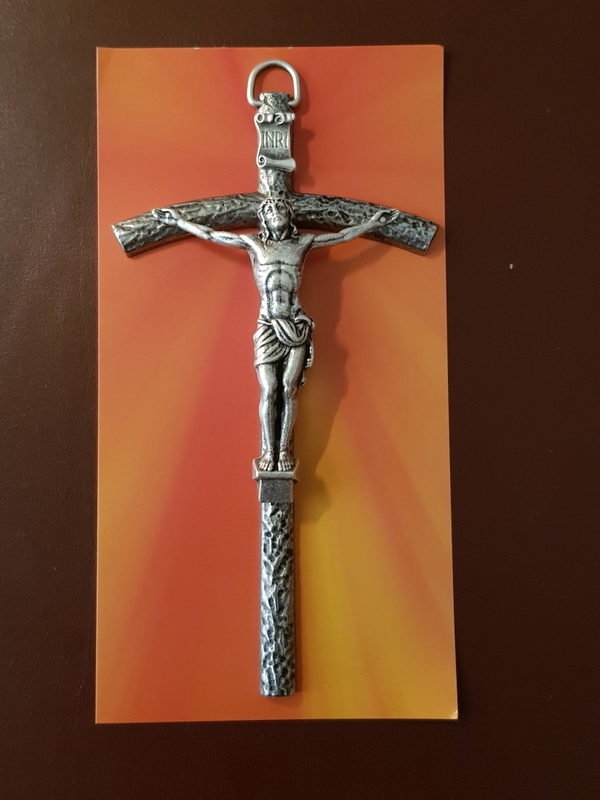 At the end of the Marian prayer, explaining the meaning of this gift, Francis said: "Today, two days after the Feast of the Exaltation of the Holy Cross, I thought of giving a crucifix to those of you here in the square. 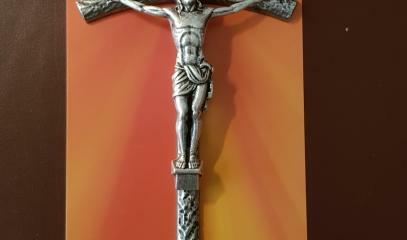 The crucifix is ​​the sign of God's love, who in Jesus gave life for us. I invite you to welcome this gift and bring it into your homes, your children's room, or your grandparents, to any part but be seen in the house ... It is not an ornamental object, but a religious sign to contemplate and pray. Looking at Jesus crucified, we look at our salvation ... I thank the sisters, the poor and the refugees who will now distribute this gift, small but precious! As always, faith comes from the little ones, from the humble ones ". Joking, Francis said that the crucifix "is free" and anyone asking for money "is being cunning". The Almonry has announced that at the end of the distribution, to the volunteers and the needy - over 300 - were offered a sandwich and a drink by Pope Francis. Previously, the pontiff had paused to comment on today's Gospel (24th Sunday for year, B, Mark 8, 27-35), when Jesus asks the disciples first of all "Who do people say I am?" And then " But who do you say I am?". "Jesus - he explained - today, addresses this direct and confidential question to each of us: 'Who am I for you?'. Everyone is called to respond in his heart, letting himself be illuminated by the light that the Father gives us to know his Son Jesus. And it can happen to us, like Peter, to affirm enthusiastically: "You are the Christ". But when Jesus tells us clearly what he said to the disciples, namely that his mission is accomplished not in the broad road of success, but in the arduous path of the suffering, humiliated, rejected and crucified Servant, then it can also happen to us, like Peter , to protest and rebel because this contrasts with our expectations. In those moments, we too deserve the healthy reproof of Jesus: "Go behind me, Satan! You do not think according to God, but according to men "(v. 33)"
"The profession of faith in Jesus Christ - he continued - cannot stop at words, but asks to be authenticated by concrete choices and gestures, by a life marked by the love of God, a great life, with so much love for others. Jesus tells us that in order to follow him, to be his disciples, one must deny oneself (see verse 34), that is, the claims of one's own selfish pride, and take up one's own cross. Then he gives everyone a fundamental rule: "Whoever wants to save his life will lose it" (v. 35). Often in life, for many reasons, we take a wrong turn, looking for happiness in things, or in the people we treat as things. But we find happiness only when love, the real one, meets us, surprises us, changes us. Love changes everything. And it can change us too. The testimonies of the saints demonstrate this ". Immediately after the Angelus prayer, the pontiff recalled his trip to Sicily yesterday and the mass he celebrated in Palermo in memory of the 25th anniversary of the death of Blessed Don Pino Puglisi, killed by the mafia. 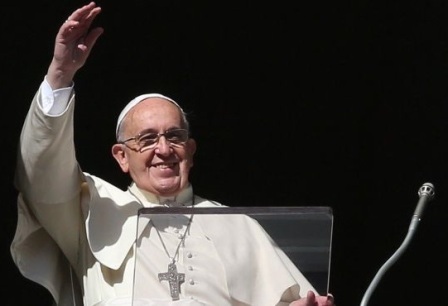 Francis invited the pilgrims to give a round of "applause for Don Pino" and one for the Sicilians "for their warm welcome". "May the example and testimony of Don Puglisi continue to enlighten us all, that good defeats evil".